Adventure Squad by Andrew Domino is a light, generic roleplaying game system that will give you an excuse to unleash the four sided plastic caltrops, strip back the vain complexities of crunchy systems and get on with it! 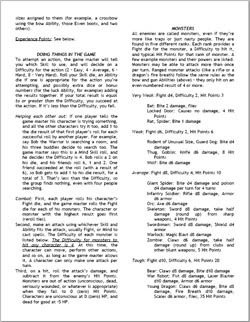 Based on Jason Morningstar's Dungeon Squad, it uses dice 'sizes' as statistic values and is very trim. Got a setting you want to run in a hurry? Adventure squad might just be the system for you. Pumping down the same vein as most generic lite RPG systems, Adventure Squad places the onus on the player to imagineer everything about the character. 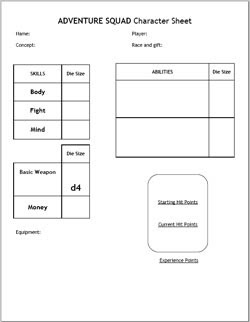 You think up a name, concept, pick a race, assign attributes (oddly called skills) and pick two abilities (like skills but not called that). A sticky spread of the GM's setting love-jam is required to add taste to the process. The attributes (yes, yes called skills) are Body, Fight and Mind. You assign D4, D8 and D12 to them. How delightful! Lovers of the much ignored D12 will cartwheeling with ecstasy to read that. Let's allow them a moment to compose themselves. The bigger the dice, the better you will be (although I inform my wife of the opposite at any opportunity). Abilities nestle inbetween where the Skills and Feats normally are. And slightly strange for a generic system - there's a list! It's a cracking list too - I couldn't think of anything that wasn't covered. The supernatural (magic/psyonic/super power) is in there too. It's a smorgasbord of things you can do. Hit points are dealt with simply, as is money and equipment. As you might expect from a game 6 pages long, common sense reigns supreme. Mechanics sprawls idly across half a page. The GM sets a difficulty number between 2 and 8, you roll the dice next to the most appropriate Attribute (it's called skill, yes, yes, I know) roll a dice for an appropriate ability. Add those together and compare to win! Combat is quick and slick. Combat die decides who will go first. You then use your Ability dice to hit them and do damage by removing hit points. Like a Michael Bay film, there are no surpises there. There are rules for players assisting each other. A concept I welcome but fear my players might find somewhat alien. For them, the joy of watching a colleague fall comprehensively on their posterior is only topped by the glee derived from twisting every mis-spoken word from their beleaguered GM! It's on the feather light side of RPGs and I am not sure it's aimed at the right target. The description is of a game for new players but it does require a lot of special dice (rather than ones scored from a battered Monopoly box) and there is very little hand holding that a new GM might need. Adventure Squad could do with some images to lighten the text load and more examples of play. 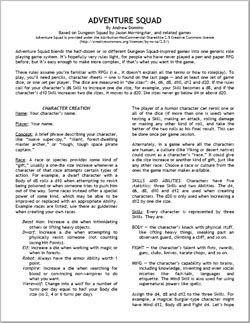 I'd like to see a few more facets of my guide to organising a free RPG, especially page numbers and a web link. The die mechanic and imaginative Ability list go a long way to make Adventure Squad worth using but I would like to see it go further. I would like to see example settings and adventures that show off the system. I'd like to see a series of bolt on optional rules and perhaps the Abilities list arranged like playing cards that you can print, cut out and hand to the players. Finally, I'd rename 'Skills' to Attributes. Adventure Squad is ideal for anyone who has a setting on the boil and needs a lite system to thicken it from soup to broth. The dice mechanic drives its novelty and good writing and clear layout throughout makes Adventure Squad a solid choice. Most importantly, Adventure Squad is under active development - which is great news as from this perfectly formed spark, a bush fire might erupt. Thank you for sharing, Andrew! I would use these rules for an emergancy backup in my RPG bag. Just in case the scheduled GM is ill. That way I could just pick up and run with it.